The Ohio River in Cincinnati has a rich history as an economic development engine as well as a source of nourishment for the body and the senses. Lessons and successes from the past continue to inform and influence the future. Follow the currents…. For centuries people have flocked to the Ohio River banks across from the Licking River. Native Americans fished, hunted, drank, ate, and traveled by the river. This exact spot is where the Hopewell people built mounds, geometric earthworks, and embankments in the central river basin. The largest of 11 mounds was 120 feet long by 60 feet wide and 8 feet high at Third Street between Sycamore and Main Streets. By the mid-18th century Anglo-American traders relied on the Ohio River to journey west of the Appalachian Mountains. After the Revolutionary War the number of travelers increased as they explored and claimed land along the banks of the river. In 1784 the State of Virginia claimed Kentucky, and control of the Ohio River but ceded to the United States the land north of the Ohio River. Article VI of the Northwest Ordinance of 1787 forbade slavery north of the Ohio River. The first permanent settlement in present-day Cincinnati occurred in 1788 at the mouth of the Little Miami. Early entrepreneurs Israel Ludlow, Matthias Denman, and Robert Patterson purchased from John Cleves Symmes 800 acres of land and created the second settlement opposite the mouth of the Licking River. The settlers arrived by flat boats. The federal government built Fort Washington, south of where Lytle Park stands today, to protect settlers from Native American attacks. After Anthony Wayne’s victory at Fallen Timbers in 1794 and the Treaty of Greenville in 1795, Fort Washington’s protection was no longer necessary, and the population increased rapidly. In 1811 the first steamboat started down the Ohio River from Pittsburgh. It was the New Orleans, built for Robert Fulton and others and captained by Theodore Roosevelt’s great-great-uncle. Cincinnatians began to build steamboats in 1816. By 1826, more than 50 boats had been completed. Starting in the late 1830s, 30 steamboats a year were produced by Cincinnati’s boat yards every year for 20 years. Fifty years later, nearly 1,000 boats had been built in Cincinnati. Corn was the primary agricultural product of the region. By 1833 hogs had also become a major export. Raising hogs and distilling liquor gave farmers additional, and profitable, outlets for the corn crop. Steamboats provided the means to take hogs and whisky to market. The steamboat era launched Cincinnati as a major city for manufacturing and trade. Steamboats handled most of the Ohio River’s commerce, which stimulated the creation of other businesses along the shore. A 1848 daguerreotype of 35 side-wheelers also shows factories, churches, colleges, liquor stores, grocer, sawmill, blacksmith, steamboat painter, boiler yard, bakery, mills, brass foundry, metal-working, and other manufacturers and businesses. Cincinnati was the 6th largest city in the U.S. at the time. Steamboat production continued for more than a century, but steamboat traffic peaked in 1852, the year when 8,000 landings were recorded at Cincinnati. The reach of the Ohio was extended with the addition of man-made canals connecting the river to the Great Lakes. Flatboats could maneuver only during high water. The key to market accessibility was establishing a canal network. The Ohio legislature approved construction of two canals in 1825, including one linking the Ohio River at Cincinnati with agricultural lands to the north. In 1825, work began on a canal system in Ohio and construction of a National Road. The Ohio and Erie Canal was completed in 1833. The Cincinnati and Whitewater Canal was finished in 1843. Its Cleves Tunnel was an engineering marvel of the time. The tunnel allowed the canal to traverse a glacial moraine between the Great Miami and the Ohio Rivers. It was the first canal tunnel in Ohio and only the 5th in the country. The Miami and Erie Canal opened in 1845, eventually extending to Toledo. Cincinnati was an important port on an extensive network of inland waterways. It completed the route that connected the East Coast to the Gulf of Mexico. Factories and mills increased as canals extended the trade route. Four hundred boats operated on the canal at its height in 1851. By this time Cincinnati was four times the size of Chicago. In the 1700s, the hillsides contained natural springs to provide good drinking water for the small population. Later some private homes had access to water hauled from the river in 1805, and the first municipal water works was established in 1839. But since the water came directly from the river, it was mixed with human sewage that was also present in greater proportion as the river trade expanded. Boats traveling the Ohio River and the canals helped spread cholera swiftly after it reached the U.S. in 1832. As Cincinnati residents had moved a few blocks north to escape the river’s flooding, and as the population grew rapidly, more families were living in crowded conditions. The mortality rate was highest in the tenements. Three major cholera epidemics occurred in 1832–34, 1839, and 1847–52. There was no cure, and people could die only a few hours after exhibiting symptoms. The scourge of cholera contributed to people moving even further north of the river to escape the disease and death. Mt. Pleasant changed its name to Mt. Healthy as a result of this influx. Eight hundred died in the first epidemic. The worst year was 1849. More than 100 people died every day for six weeks. The cause was not discovered until 1883, but Dr. Snow in England urged greater water sanitation in 1849 and demonstrated that cholera declined with better sanitation. In 1853, Cincinnati began planning the first coordinated sewer system. In the 1840s and 1850s private companies laid thousands of miles of railroad track throughout the region, especially north of the Ohio. In the beginning the railroads were part of the transportation system, working with the river trade. With names like the Baltimore and Ohio and the Chesapeake and Ohio, the railroads acknowledged the importance of the Ohio River. By the 1850s numerous railroads connected the river North and South. Instead of supplementing the riverboat traffic, the railroad became a competitor. It was a primary mode of transportation with its own robust network of tracks criss-crossing the country. Trains were considered more reliable than riverboats. The tracks wouldn’t fluctuate depending on the weather. During the Civil War, the railroads were replacing the rivers, a process which only accelerated further after the war. Chicago became an important railway hub for the Midwest. Cincinnati’s population and economy ceased its rapid ascent. Road traffic increased too. In 1866, the Cincinnati Suspension Bridge, designed by John Roebling, was the first bridge over the Ohio River, connecting Cincinnati to Covington, Kentucky. The Louisville and Nashville line completed the L&N railroad bridge over the Ohio River in 1872. By 1880, trains not boats, carried the majority of passengers and cargo. During the Civil War a pontoon bridge was completed across the Ohio River in 30 hours, near where the Suspension Bridge was being built. It would have allowed 70,000 Union troops to cross the river to meet Morgan’s Raiders, who retreated as soon as they heard about it. There was another type of railroad network. The Underground Railroad was a loose system of abolitionists who provided food, shelter, clothing, and safety to countless people escaping slavery for freedom. Many Cincinnatians helped slaves escape to the North. There was also a Maritime Underground Railroad. Many fugitive slaves stowed away on steamboats and sailed to freedom, often with the help of African Americans on board. The Ohio River was the gateway to freedom. The Ohio River had an impressive range, from a low of less than 2 feet in 1881 to its highest crest of 80 feet in 1937. Its natural feat of wonder played havoc with the people who depended on the river for travel and commerce, or even to stay out of their homes. If the winter and spring brought a lot of snow and rain, then the river flowed over its banks in a swath thousands of feet wide. If the summer was dry, the water level was so low that it was easy to walk across to Kentucky. When that happened, boat traffic came to a standstill, which could last for weeks and disrupted the flow of commercial goods by river. What has constituted the flood stage has changed over time. From 1873 to 1898, it was considered 45 feet. From 1899 to March 31, 1922, the flood stage was 50 feet. Since April 1, 1922, the flood stage is 52 feet for the Ohio River at Cincinnati. One hundred times the Ohio River has risen above the 52’ flood stage. A major flood occurs when the water tops 65 feet. Seven floods have qualified as major. They happened in 1883, 1884, 1907, 1913, 1937, 1945, and 1964. In 1907 and 1913, there was another flood almost as bad a couple of months later. Three floods came close to the major stage (between 63.6 and 64.8); they were in 1933, 1948, and 1997. The top ten highest crests in recorded history have ranged from 63.6’ (1933) to 80’ (1937), and they have all occurred between late January and mid-April. One of the worst floods in Ohio occurred in 1913, killing almost 350 people and damaging an estimated $100 million in property. The Conservancy Act passed in 1914. It allowed flood-control districts to be established based on entire river systems. This created many flood-control dams and reservoirs throughout the state. The major floods of 1884, 1913, and 1937 had the most impact on the community and the Ohio’s capacity as a working river. In the fall the Ohio River fell to its lowest annual stages. Some of the levels are hard to imagine today. Between 1862 and 1895, five times the river sank below 2.5 feet. In the early 20th century, local residents used the river as a watering hole. The summer depth was about 9 feet deep. There were beaches in Dayton and Bellevue, Kentucky. Several times the Ohio River froze. It happened in 1904-1905, and again in 1918 for 51 days. Eight steamers had their hulls crushed by the ice. It froze again in 1978. The U.S. Army Corps of Engineers first began improving the Ohio River in 1824 by dredging sandbars and removing snags. Dry weather made it impassable for boat traffic. Before the construction of a series of locks in the early twentieth century, the Ohio River’s navigability was unpredictable. The first lock and dam was completed in 1885 about five miles below Pittsburgh, and 12 more were built in 1910. In Cincinnati, the Fern Bank dam was constructed in 1911 and lasted until 1963 when a new group of 19 new dams were built, raising the level to 25 feet. This depth allowed the passage of bigger tows that were starting to appear on the river. The U.S. Army Corps of Engineers completed the channelization of the Ohio River in 1929 with 50 lock and dam structures along the Ohio River to reduce the impact of flooding and provide for better navigation. This system was later replaced by a high-rise system of 20 dams. Nine navigational projects (locks and dams) are in operation today along the Ohio border of the Ohio River. The Ohio River has a total of 69 locks and dams. Following destructive floods at Johnstown, Pennsylvania, in 1889 and the 1937 flood in Ohio, the U.S. government built a series of flood-control dams. At the start of World War II fences were erected around the dams on the Ohio River to protect them from sabotage. Industry continued to expand following World War II, with the construction of aluminum plants and chemical factories along the Ohio River. Today the river carries cargoes of coal, oil, steel, and manufactured articles. The 1907 Kessler Parks Plan recommended a park system for the City of Cincinnati. It designated no park space on the riverfront, although it did advocate a parkway system designed to improve cross-town and downtown circulation for commuters. For example, Kessler recommended replacing the Miami and Erie Canal with Central Parkway as a key to making the downtown business district successful. He left the riverfront to waterfront commerce, industry and the railroads. By 1940 only 1,700 people lived along the riverfront. The area was run-down. Vacant buildings and vacant land abounded. Wholesale produce markets had moved to this area known as the “Central Bottoms” for access to the railroads and low rents and taxes. They did not rely on the river. There were also very old tenement buildings and a few factories. In 1939, a “Redevelopment Plan for the Central Riverfront” had been proposed. With the advent of World War II, the plan was postponed. The City Planning Commission incorporated its components when it published the Cincinnati Metropolitan Master Plan 1948. The 1948 Master Plan turned its attention back to the riverfront. Chapter 13, “The Riverfront,” starts with “The Riverfront Problem.” It was especially concerned about the poor condition and underutilized land immediately adjacent to the south of the Central Business District. The 1948 Master Plan recognized the value of the riverfront to the City. Build above flood levels or build to withstand the inevitable flooding. The 1937 flood was still a fresh and horrific memory, but the 1948 Master Plan recommended against a flood wall along the riverfront because of the expense. In addition to raising development above the flood plain, it recognized that some localized flood protection could be a viable strategy, but that direct access needed to be provided from the elevation of Third Street, the first safe street during the 1937 Flood, the worst flood in Cincinnati’s recorded history. The 1948 Master Plan spawned the first iteration of Fort Washington Way (also known as the Third Street Distributor), which was constructed from 1958-1961. Construction on the Cincinnati Riverfront Stadium started in 1968. Although vast areas of the basin had been cleared and a substantial transportation investment made, residential or commercial construction on the model suggested in the 1948 Master Plan only resulted in one building, One Lytle Place, constructed in 1980, two blocks east of the current ballpark. It remained faithful to the 1948 Master Plan by providing its primary garage and vehicular access with a bridge to the high ground at the Third Street elevation. The grand civic buildings never appeared. Urban Design Associates presented a conceptual draft plan in 1997 as part of a joint effort by Hamilton County, the City of Cincinnati, and the Ohio Kentucky Indiana Regional Council of Governments (OKI) to solve the riverfront problem while they worked to sort out regional transportation issues and deliver on the wishes of their professional sports teams. A major flood in the Central Riverfront that year helped solidify the design concepts that drove the plan. Urban Design Associates completed the Central Riverfront Urban Design Master Plan in April 2000, and the Riverfront Advisors Commission accepted it in May. The City Planning Commission approved it in June, followed by City Council in October. The Banks Project Plan in 2007 brought a modification of the street grid plan and an increase in development footprint and density. A series of complex agreements formed the public-private partnership that has made the progress to date possible. The developer’s Planned Development was approved on November 1, 2007. Harriet Beecher Stowe published her book, Uncle Tom’s Cabin in 1852, and she wrote part of it while living in Cincinnati. It intensified the national debate on slavery and featured memorable scenes like the one of Eliza and her son escaping north on the frozen Ohio River. Escape from slavery via the Ohio River at Cincinnati was the theme of two other works of art. In Beloved Toni Morrison wrote the story of a slave family in 1856 and the terrible sacrifices they made. In 2005, this story was turned into an opera and Margaret Garner premiered at the Cincinnati Opera. The Showboat Majestic has been entertaining visitors in a riverfront location since 1923. The City of Cincinnati acquired the Showboat Majestic in 1967. It is the last original floating theater in the U.S. It was added to the National Registry of Historic Places in 1980 and became an official National Historical Landmark in 1989. It is permanently moored at the Public Landing. The Appalachian Fest started in 1970, but its 42nd annual celebration was cancelled in 2011 due to flooding. The first Tall Stacks event occurred in 1988, bringing crowds of people to hear music and visit steamboats docked along the Public Landing and Serpentine Wall. It was one of five events that took place throughout 1988 to commemorate Cincinnati’s 200th birthday. The first Tall Stacks welcomed 14 riverboats and over 700,000 people to celebrate the music, steamboats, and rich history of the river. The opening in 2004 of The National Underground Railroad Freedom Center had national significance, and the new museum intentionally had its front door face the river. The Serpentine Wall, Bicentennial Commons at Sawyer Point, and the Theodore M. Berry International Friendship Park were designed with architectural style and with places for performance, public art, and sculpture. The influence of the 1948 Master Plan was reflected in the projects that started happening from the 1960s on. In 1961 Fort Washington Way was opened, and it cut off the riverfront from downtown. The Cincinnati Reds new home, Riverfront Stadium, was completed in 1970. In 1975, the Riverfront Coliseum opened. The Cincinnatus Association gave money in the early 1960s for the construction of Yeatman’s Cove Park. The City created the Serpentine Wall, which also helped protect the park from flooding. Yeatman’s Cove Park, with the Serpentine Wall, opened in 1976. The first Riverfest, with fireworks synchronized to music, was organized by a local radio station, and it took advantage of the new park to attract a large crowd. The only housing from the 1948 Master Plan, One Lytle Place, was constructed in 1980, two blocks east of the current ballpark. In 1988 a new riverfront park was planned to celebrate the city’s 200th anniversary, and Bicentennial Commons Park at Sawyer Point opened in 2002 with many amenities and attractions. Critical events occurred in the early 1990s that would bring a further evolution of the riverfront plan and the beginning of its next phase. First, Fort Washington Way had been showing, for some time, advanced stages of deterioration. Its accident rate became the highest of any mile of urban freeway in Ohio, mostly due to high traffic volumes and confusing traffic patterns. Development on the riverfront has gone from the often flooded cradle of its early settlement, to a desolate area of railroads and warehouses, to its low point as supplemental parking for the Central Business District. In 1995, the City worked with the Ohio Department of Transportation to develop a new Fort Washington Way that could also bring economically viable development to the riverfront. Hamilton County voters approved a half-cent sales tax to fund new development on the riverfront in 1996. The 1997 conceptual Central Riverfront Master Plan had shown three alternatives for locating the baseball stadium, two of which were on the river. A voter referendum in 1998 decided on a riverfront location for the new Reds ballpark. The City began the reconstruction of Fort Washington Way. The same year the Cincinnati Park Board created a Master Plan for a new riverfront. In 1999 Cincinnati City Council and the Hamilton County Commissioners appointed the Riverfront Advisors Commission in February to gather public input. The Commission proposed a new development, called “The Banks,” between the two sports stadia. Urban Design Associates completed the Central Riverfront Urban Design Master Plan in April 2000, and the Riverfront Advisors Commission accepted it in May. The City Planning Commission approved it in June, followed by City Council in October. Also in 2000, the demolition of Cinergy Field began for construction of the Great American Ball Park, and the new home for the Cincinnati Bengals, Paul Brown Stadium, opened. 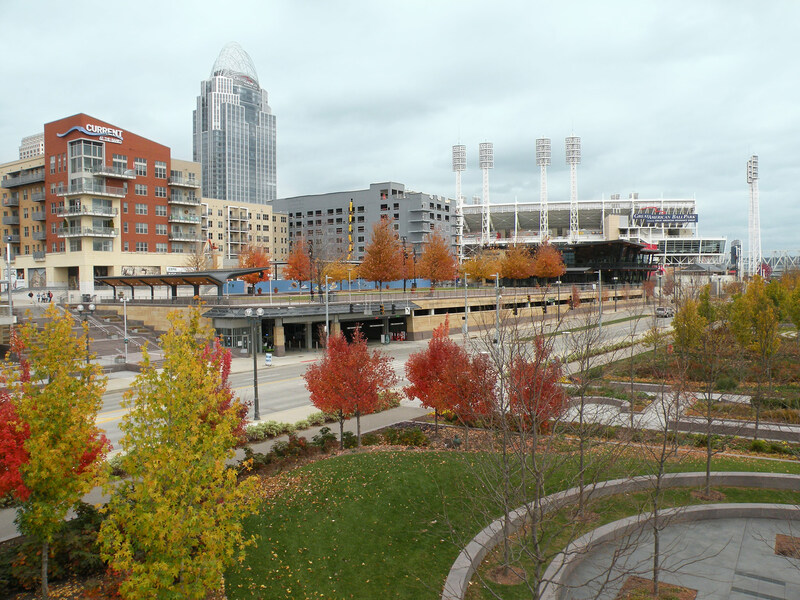 The Great American Ball Park opened in 2003 as did the Theodore M. Berry International Friendship Park, which contained public art, sculpture, gardens, and paths for walking and biking. A complete rework of the transportation infrastructure was necessary to create a true mixed-use development and to make that effort economically sustainable by linking it to the Central Business District and Northern Kentucky. Fortunately, the opportunity to do that critical infrastructure rework occurred at the same time because the Ohio Department of Transportation, the owner of the facility, determined that Fort Washington Way required a substantial rehabilitation. This complete reconstruction enabled the Central Business District street grid to pass over the roadway at an elevation above the highest flood level. It would integrate with a floodable intermodal transit facility to provide a flood-proof development podium and excellent transit connections. Make it a focus of civic pride, not just an economic engine. In order to take advantage of the excitement of the construction of the Bengals new facility, the team decided to call the project FWW 2000, completing the link in the public’s mind of the critical relationship of the transportation investment and the stadium. The 1997 Central Riverfront Master Plan played a critical role in demonstrating how necessary it was for the public parties to expend considerable dollars in enabling transportation work to make the stadia and development possible. By the time that another voter referendum in November 1998 resolved the location of the new Reds Ballpark, the City had already begun the reconstruction of Fort Washington Way based on the plan. The Riverfront Advisors Commission named the area “The Banks.” By the time that the final Central Riverfront Urban Design Master Plan was approved in 2000, the County had nearly completed the Bengals stadium, and the City had nearly completed the reconfiguration of Fort Washington Way, both faithful to the draft 1997 plan. Integral in the planning of the riverfront, the Riverfront Transit Center, located under Second Street, opened in 2002. Its planning, funding, and construction taxed the team from the City and its consultants, and unfortunately to date it has not fulfilled its promise. Although OKI recognized the need for a transit center, served by multiple modes, getting some agreement on its location and even its purpose proved difficult. Its location made it convenient to connect to riverfront rail lines to the east and west, and to a proposed light rail line. It was also on multiple bus lines on the surface streets, and its vast reservoir of parking could conveniently serve the Central Business District. To date, however, event buses have been the only users of the facility. By 2002, the citizens of Cincinnati and Hamilton County did not want an additional tax and more construction, and they voted down a levy to fund “Metro Moves,” sidelining the light rail and a reworked regional bus system to some future time. With the construction of the two stadia and the National Underground Railroad Freedom Center, the basic shape and boundaries of The Banks began to form. The revamped Fort Washington Way and the Riverfront Transit Center provided the infrastructure foundation. Starting in 2008, some of this early promise came together with the groundbreaking in April. It marked the beginning of rebirth with a new residential and commercial neighborhood, driven by a transportation plan and transportation investment.